Scientists in the United Kingdom, Switzerland, and Ireland have demonstrated how solar and wind renewable energy technologies across Europe are affected by long-term weather patterns. Using three decades of meteorological data, the researchers studied and additionally modeled the effect of renewable energy on the electricity sector through 2030. 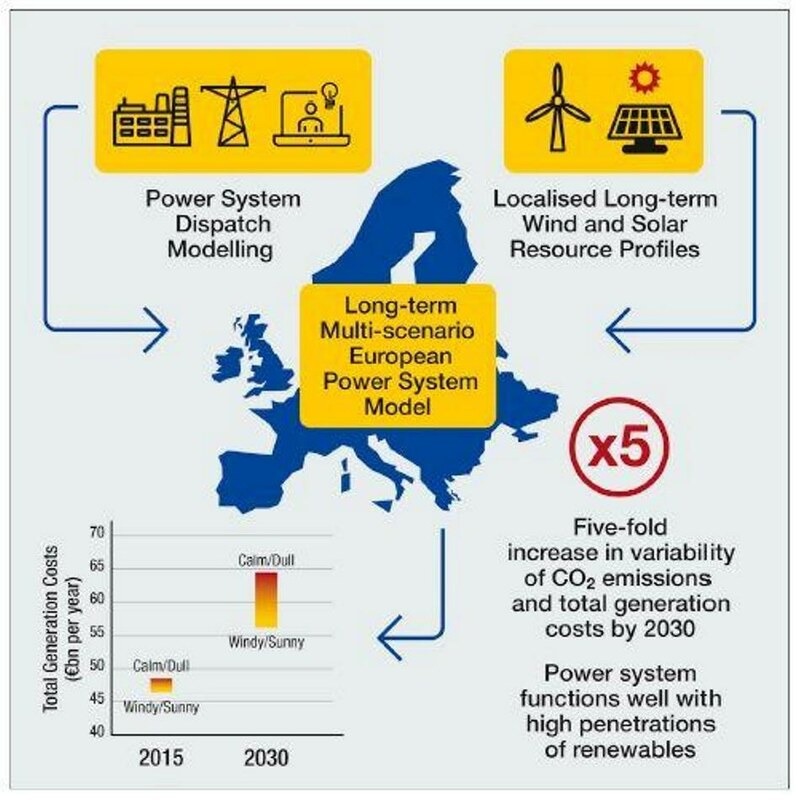 The study indicates that in spite of the unpredictable nature of solar and wind energy, these renewables will easily enable the European power system to produce a minimum of 35% of its electricity, without causing any major impact on the stability of the systems or prices. The paper has been published in the journal, Joule. In the last 10 years, solar and wind energy have increasingly become popular across Europe as green alternatives to conventional carbon-based energy, increasing fourfold in use from 2007 to 2016. Yet, these technologies have certain drawbacks - both are sensitive to changing weather patterns, raising concerns regarding the ability of Europe to withstand long spells with overcast skies or low winds. In order to model this variability in solar and wind energy and its impact on markets, researchers have applied years of historic weather data. However, several studies only examine the data from one specified year or concentrate only on a small region or a single country. Both the spatial and temporal limitations of earlier studies were challenged by the researchers after they examined the operation of the electricity system throughout Europe - including technical operational limitations and power transmission between countries - using solar and wind data covering a three-decade period between 1985 and 2014. By exposing trends from this age-old data trove throughout a large, interconnected region, the researchers successfully modeled the way Europe would fare under five varying renewable energy scenarios with different sustainability goals 12 years into the future. The depth and breadth of the researchers’ data pool appeared to make all the difference when it came to comprehending trends in CO2 emissions, system operation, and system costs—all of which are vital to the effective advancement of energy policy. When planning future power systems with higher levels of wind and solar generation, one year of weather data analysis is not sufficient. We find that single-year studies could yield results that deviate by as much as 9% from the long-term average at a European level and even more at a country level. When there are legally binding targets on carbon emissions and the share of renewable energy, or promises to avoid sharp price hikes, this makes all the difference. By applying numerous years to better comprehend the way other variables respond as solar and wind energy enter the market, Collins and his group discovered that CO2 emissions and overall energy generation costs vary dramatically in upcoming scenarios. It is likely that these will become up to five times more ambiguous, as weather-reliant resources gain more traction in the market. Yet, the researchers also observed that this variability could be handled relatively well by Europe due to its close integration - the team’s models estimate that Europe could utilize renewables for over two-thirds of its electricity by the year 2030, with over one-third coming from solar and wind energy. According to Collins and his team, their data and models can possibly be used to represent a range of potential future scenarios so that policymakers will be able to better comprehend the impact and reliability of renewable energy, including the effects of a shift to complete renewable electricity systems. By rendering their data and models openly available, the team also believes that future work will show greater awareness of these lasting weather patterns so as to correctly represent a more renewable-energy-dependent world. For future policy developments to be robust and to capture the meteorological dependency of decarbonised energy systems, they should be based on open modeling analyses that utilise common long-term datasets. The Science Foundation Ireland (SFI) MaREI Centre, the European Research Council, and the EPSRC supported the work.